The preview also shows the new prices on home products like storage furniture and vacuum cleaners. Find the best vacuums like Hoover wild tunnel 2 whole house rewind upright vacuum which is one of the handiest and practical solutions in stores like Target. Pay only $99.99 and save $30 on that product. You might need some solutions for your laundry carrying, organizing, and ironing. 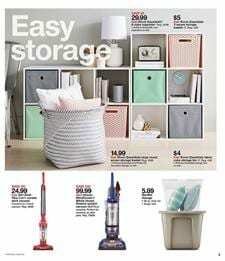 Find nice solutions and ideas on pg 10 from this Target Ad. The deals are effective until Feb 16. Visit pg 11 for kitchen appliances. Get your filtered coffee ready in mornings. Target has the exclusive color of Cuisinart programmable coffeemaker. Navy color will be unique to Target customers. Pay only $54.99 for a first class coffee maker. It's simple, practical, fairly priced and has any feature you would expect from a coffee maker. Cuisinart's more kitchen devices are available there. See the details of living room furniture, accessories, decorative products and more on pg 13. Get 15% off indoor and outdoor furniture and rugs with the Target's Coupon.